Keyboards have come a long way since PCs took over the world, but most still use the same basic layout from decades ago. If you want something more comfy, an ergonomic model is the answer. Typing is a fundamentally unnatural motion. Early homo sapiens didn’t sit down after a long mammoth hunt to punch out an actuarial report on his Apple 0.000002. And the precursors of modern keyboard layout design, from the rectangular shape to the QWERTY layout, weren’t made with the advantage of today’s knowledge of ergonomics and the wear and tear that repetitive motion can take on your muscles, joints, and tendons. The keyboards below, while not a complete solution to typing fatigue or RSI, are designed to shift your typing position and motions into something more comfortable and sustainable for extended work or play sessions. A split layout is best, since it allows your hands to more naturally separate and rest perpendicular to your body. 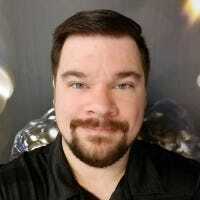 But if you can’t adjust to some of the more extreme variations of a standard layout, a more conventional raise-and-curve approach can still be beneficial. We’ve chosen the best overall keyboard, along with the best picks for gamers, frequent travelers, penny-pinchers, and mechanical keyboard enthusiasts. If you’re serious about starting and maintaining healthier typing habits, the Kinesis Advantage2 is the way to go. This monster block of metal and plastic splits the standard QWERTY keyboard apart, puts the main typing buttons on a comfy concave curve for either hand, then moves formatting keys away from your weaker pinky and ring fingers to let your thumb do the heavy lifting. It’s a proven and much-loved method of creating a better typing experience, albeit with a hefty investment and a steep learning curve for the modified layout. The design includes full key remapping if you think another layout will work better for you, as well as Dvorak support (with printed keycaps on the “QD” version) and custom macros. All Advantage2 keyboards use Cherry MX Brown switches with tactile feedback, except the specialist “LF” model with linear Red switches. Silver colors and graphite cases are even more expensive upgrades, and UK, Swedish, and German layouts can be found as well. 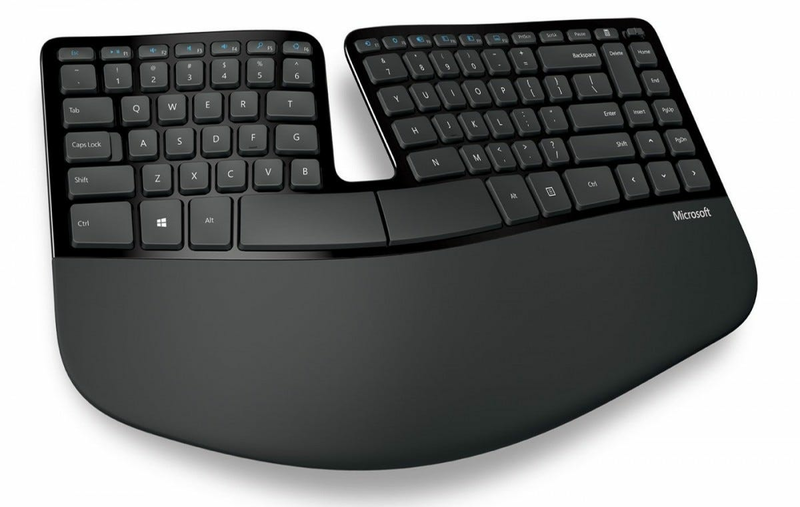 Microsoft has been making curvy ergonomic keyboards for over two decades, and their latest model combines that comfortable function with a surprisingly elegant form. 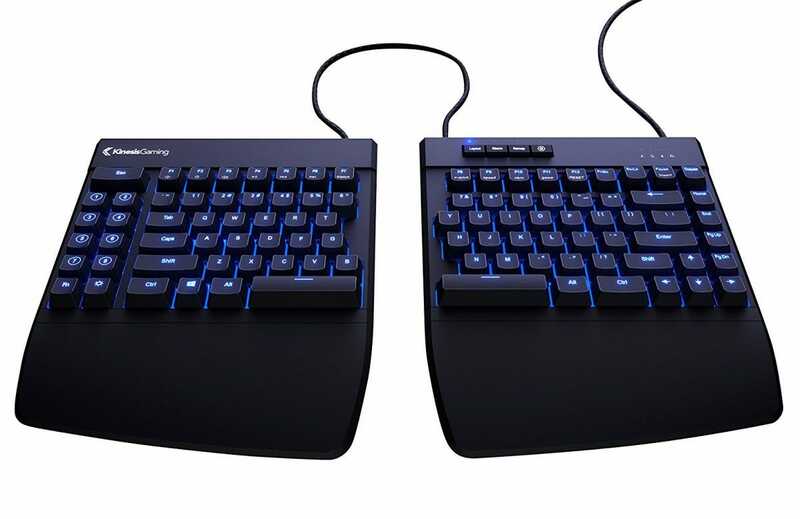 The Sculpt Ergonomic Keyboard set technically has a sticker price of $130 with its companion mouse, but you can find the keyboard alone for under $70 online without the retail packaging, making it the cheapest option on this list by half. It’s also a pretty good compromise if the modified key layouts in other split designs are intimidating for you. The Sculpt still splits the keys into dedicated hand zones, but the standard QWERTY layout remains, along with some decent non-mechanical switches under the chiclet keys. The package includes an optional ramp to raise the board even higher and create a forward cant, and the separate wireless number pad can be moved around (or simply put away if you don’t use it). 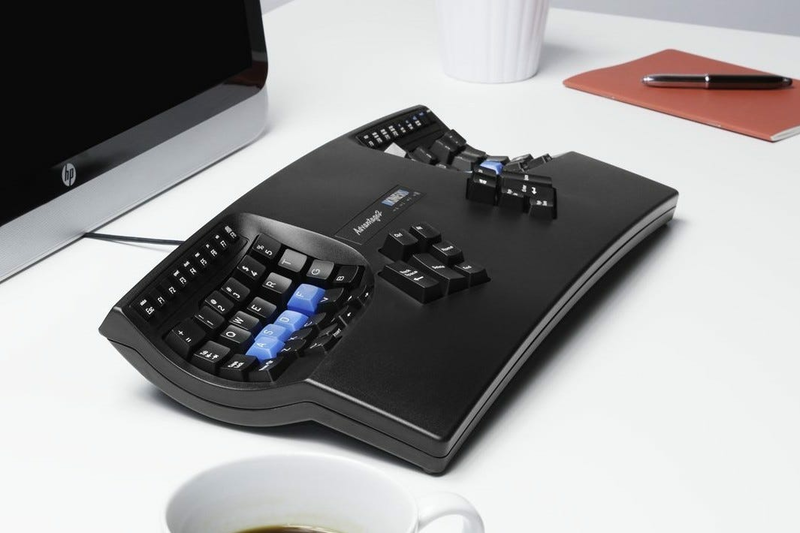 The modified layout and extra curves of an ergonomic model make it bigger than a standard keyboard out of necessity. If you need something smaller for limited desk space, or you want a trusty keyboard that can easily fit in a travel bag, the Freestyle2 is the best pick. Unlike the Advantage, this split keyboard uses a standard layout, only moving the less-used control keys to vertical columns on either side for easy reach. 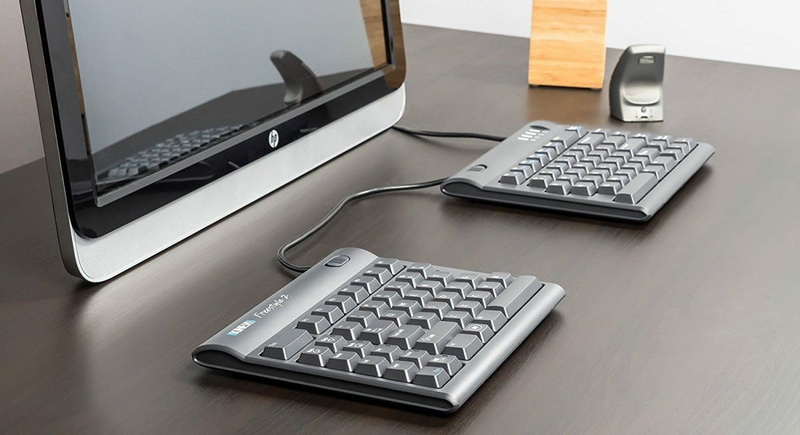 It’s small enough to fit into the space of a normal keyboard, but the optional hinge and connection cable allow for separation and tilting when more space is available. There are a lot of variations on this design: PC, Mac, Bluetooth for PC and Mac, and a handful of international layouts, all with either a standard 9-inch central cable or a more flexible 20-inch upgrade. Whichever model you choose, the $40 VIP3 add-on for tilted risers and palm rests is a very good upgrade. If you’re deeply invested in the mechanical keyboard craze, then none of the other options on this list is going to scratch your itch for customization. 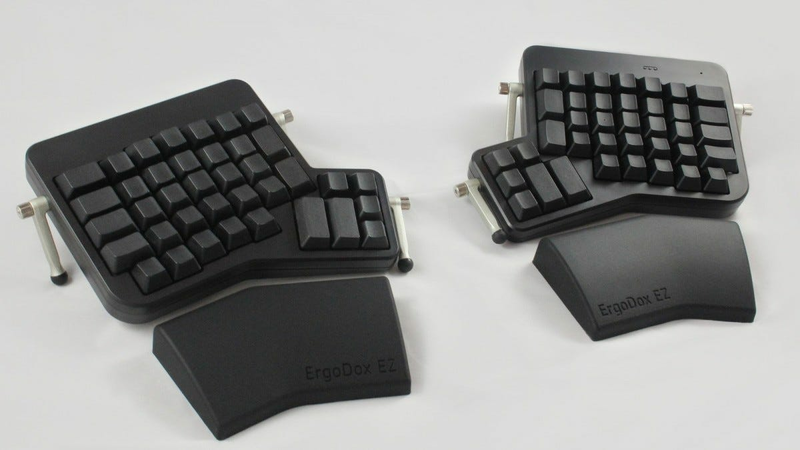 Enter the ErgoDox, an open source keyboard design that borrows the primary layout from the Kinesis Advantage, but ditches the concave curve for a full case split. The open source aspect allows anyone to build and program an ErgoDox if they have the expertise, or simply buy standardized parts (a case, printed circuit boards, switch plates, switches, and keycaps) and assemble it themselves. 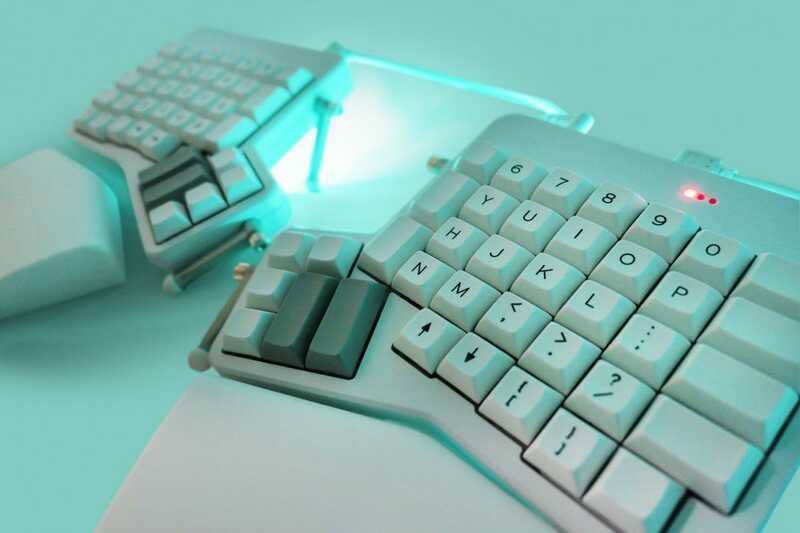 This opens up an amazing variety of customization options, and the design has become very popular—even enthusiast keycap drops usually offer an extra key package for ErgoDox owners. If you’re not ready to break out the soldering iron, the ErgoDox EZ is a pre-built version of the design that allows buyers to select a case, mechanical switch, keycaps, LED lighting, and tilting add-ons. Prices range from $235 for the bare-bones version without keycaps up to a whopping $354 for all the bells and whistles. As a bonus, the latest version of the EZ is entirely modular, allowing enthusiasts to swap in new and different switch designs on a whim. The Edge Split takes the standard design of the Kinesis Freestyle, retools it with a bigger body and comfy palm rests, and swaps out the rubber dome keys for gamer-friendly Cherry MX Blue, Brown, Red, or Silver switches. The split remains, with a long enough central cable that you can use the left side alone if you so desire, though there’s no wireless option. The keyboard comes with full programming software for custom binds and macros—especially handy for the extra number pad on the left—and N-key rollover for intense sessions. Customized programming can even be saved to the keyboard itself, for when you’re moving between multiple machines. LEDs are standard, but only available in blue. If you like the idea of a split board for gaming but already have a keyboard you like for typing, you should check out some of the dedicated left-hand gamepads on the market. Does A “MIL-STD Drop Test” Phone Case Actually Mean Anything? With phones getting ever bigger, more slippery, and more expensive, you might be looking for an extra-tough case to protect your investment. Will spending extra money on a “MIL-STD” model actually do anything though?